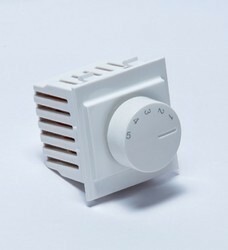 This 5 Step Fan Regulator is made of premium-quality material, which makes it durable. Socket modules: 6a 2/3 pin socket (2m), 6a 2 and 3 pin socket (2m), 6/16 a 6 pin power socket (2m), 25/6 a 6 pin socket (2m), international socket 13/6 a (2m), socket 6a 3/2 with push button (2m), 2 pin euro socket (1m), 16a socket + plate combo (fits in 2m box). 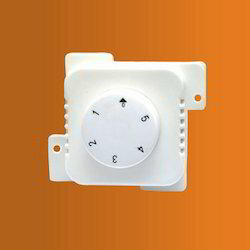 We are the one of the reputed names engaged in manufacturing electronic fan regulator that are available in many variations such as size, shape and designed as per the relevant market standards. Fan regulators are offered under the brand name of Destano and omega are completely safe and secure to use. No radio frequency interference.Good ventilation assuress no heat generation.Energy congervative design.No humming Noise. We are manufacturer of Electronic Fan Regulator. We feel proud to introduce ourselves as a reliable organization, engrossed in supplying the broad assortment of Electronic Fan Regulator. Our experienced professionals use quality assured component and cutting-edge technology in manufacturing process of this regulator. Provided regulator is checked by our quality controllers to offer a flawless range to our clients.